Translation industry events are probably one of the most important parts in the marketing strategy of many language professionals. But there is more to industry events than just registering and showing up. Be it as an attendee, a speaker or a sponsor, industry events offer freelance translators and others in the language industry the possibility to learn about industry trends, gain new skills and network. So, once you have registered for an event, what can you do to prepare and get the most out of it? This is the first in a series of weekly blog posts with tips to get the most out of translation industry events. These tips will be grouped into “before the event”, “during the event” and “after the event” for easy reference. Please feel free to post below and share your tip(s)! Once you have decided to attend an industry event and signed up, the next step is to build relationships with other event participants or reinforce relationships with participants you have already met. Why wait until the event to let others know who you are? Why not share now your expectations? Why not let others know more about you, the services you offer, your fields of expertise, etc. and get to the event feeling you already know everyone? Pre-event networking is probably one of the most effective and easy strategies event attendees can apply to put themselves on event participants’ radars (colleagues, potential clients and vendors) and get the most out of an event when the moment comes to network in person. Write and share your bio: if the event registration platform allows it, in two or three lines, tell other event participants who you are, where you live, the services you offer, your credentials and any other relevant details. This bio will not only help participants to know you, but also to remember you. Make sure you also check bios written by others and see if any of them live in your country or work in your fields of expertise, you may want to invite them a cup of coffee during the event to share experiences. Interact via social networks: in general, industry events have dedicated hashtags for Twitter and Facebook. Check out the activity under the event hashtag in the weeks leading up to the event to see who else is attending. Check attendees’ posts, share their important messages, mention them in comments, follow them (or add them as friends). This will also help other attendees to remember you when you meet at the event. Express your expectations: when possible, share your expectations of the event with other attendees (“I’ll be attending the session on negotiation tips because I need to learn new negotiation strategies. Anyone else attending?”). You may be surprised to see that others may also share your expectations, or learn what others would like to get out of the event. Engage in discussions: based on the event program, propose topics for discussion via social networks, or post to discussions and share your views. Sharing your ideas about a given topic will encourage others to do the same, allowing all involved to learn more and be better prepared for sessions you will attend in person. Contact attendees directly: if possible, contact one or two attendees directly and make plans to share a meal or a drink during the event. Keep in mind that contacting all attendees may be both annoying for them and fruitless for you. Focus on attendees that work in your language pairs or in your fields of expertise for instance, people that will have points in common with you and that may provide you with useful insights about the industry. Technological developments over the last years have facilitated pre-event networking and now professionals can meet way before they actually meet face-to-face. It’s up to you to meet and network with colleagues attending future industry events to get the most of these when attending! What other tip(s) would you add on pre-event networking? What has worked for you? What hasn’t? The 2013 ProZ.com international conference in Porto in over, but its spirit still seems to be in all and each of the attendees to this event. With hundreds of Tweets, Facebook posts, feedback comments, pictures, videos, reports and whatnot, this conference seems to have reminded professionals of the importance of networking and learning in professional development. Careful planning and detailed organization were evidently the secret ingredients for the success of this event. The three session tracks offered led to a good variety of presentations to choose from and the different social options available –sightseeing tour, wine taste, powwows– helped attendees to make connections more quickly and easily. Thirty different sessions, divided in three tracks. Two powwows, one at Restaurante Commercial, one of the most iconic restaurants in Porto, and a second one at Restaurante BibóPorto, a restaurant that offers exquisite traditional Portuguese dishes. A sight-seeing tour around the city. A wine taste at Burmester Cellars, where we had the chance to taste the most famous port wine. A gala dinner also with great food and wine. A one-day workshop on “Negotiation”. The chance to meet fellow translators and promote themselves among peers. As a ProZ.com staff member, I must say that I’m not only proud of being part of this amazing community, but also honored to have had the chance of spending these amazing days with new friends. Thanks Paula Ribeiro, Maria Pereira and Rafaela Lemos for working tirelessly over the past year to bring this wonderful event to life. Also, thanks speakers for sharing your time, energy and expertise. And, above all, thank you attendees for making this event possible! The ProZ.com Certified PRO Network, an initiative of the ProZ.com community that has the purpose of identifying qualified translators and providing them with the option of networking and collaborating while distinguishing themselves as professionals, is now open to translation companies willing to demonstrate their unique capabilities in keeping with published industry standards. The ProZ.com Certified PRO Network keeps growing. More successful service provider-outsourcer working relationships. More room for direct communication and collaboration between service providers and companies. 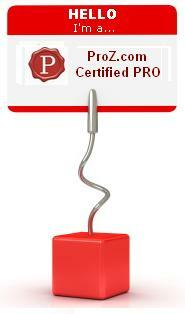 A better understanding on the part of outsourcers of what being a Certified PRO means. Translation companies willing to enter the ProZ.com Certified PRO Network will be required to prove that they meet or exceed minimum professional standards in two screening areas: (1) business reliability and (2) good citizenship. Information that screeners will check when reviewing company applications includes Blue Board record history and payment practices, number of years in the translation industry, client feedback, standards or certifications, quality processes followed and ProZ.com activity. Other data, such as services offered and capacity, may also be taken into account. If you run a translation company, consider applying for inclusion into the Certified PRO Network by completing your online application. More information about PRO certification is available in the Certified PRO Network FAQs section (recently updated). Application from freelancers are also being reviewed on a daily basis. So, if you are a freelancer and you would like to enter the network, apply now.